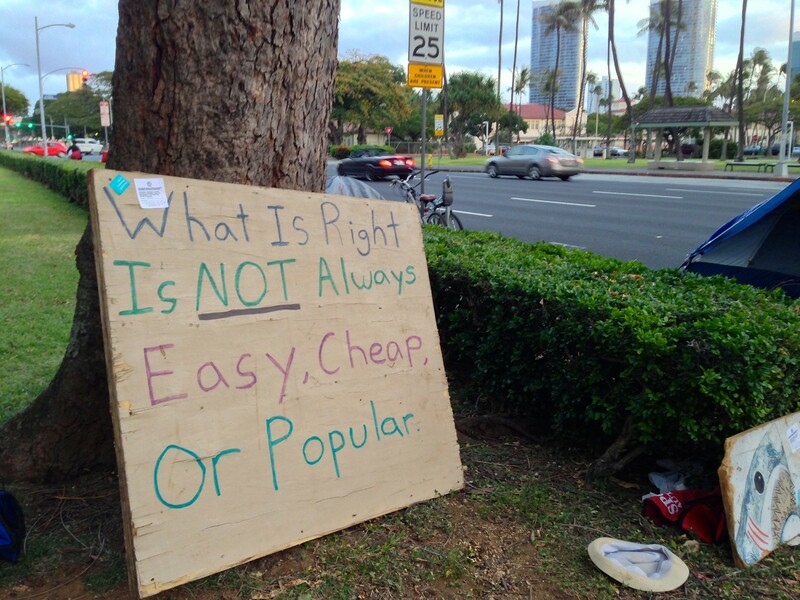 Honolulu 3/6 – As (de)Occupy Honolulu sues the City & County of Honolulu in federal court over deprivation of civil rights during raids; the city fights back by criminalizing the houseless population in an attempt to remove the protesters. The City Council has submitted Bills 2, 6, & 7, targeting the houseless. Bill 2 is much like the current Bill 54, however makes sidewalks no longer public property. Bill 6 criminalizes anyone who has a tent on the sidewalk. The fine is up to $1000 and/or up to a year in jail with the instant confiscation of belongings. Bill 7 would define tents as a “nuisance” with the instant confiscation of belongings that will cost $200 to retrieve. City Council member Ikaika Anderson has been at the forefront of this bills that will further criminalize the houseless in an effort to remove the movement. “Where do the rights of the Occupiers end,” asks Anderson. The City Council is not the only official supporting the legislation. Mayor Kirk Caldwell had stated that he intends to sign the Bill 7 and has requested city officials to escalate raids to every week. After sidewalk closures for tree trimming, the world’s longest running Occupy encampment moved from the north side of the park to the south side of the park. The movement has been hard at work discussing real solutions to the houseless problem. A resolution is being submitted to the city proposing to end (de)Occupy’s 24/7 vigil, that highlights the houseless crisis, at Thomas Square. To stand in solidarity with those who are otherwise invisible, looked down upon, treated as criminals, chased from the streets and parks, harassed, abused and forgotten. That all government programs follow international human rights standards, including the United Nations Declaration on the Rights of Indigenous Peoples and the Universal Declaration of Human Rights. We are committed to these goals because they are the fair, just, and right thing to do.